Thank you for visiting our blog. Our home in rural DeKalb County, IL is where we wanted to stay for good. We have put so much into our home to make it a place where we would love to live and raise our children, and unfortunately we are being forced to live differently. 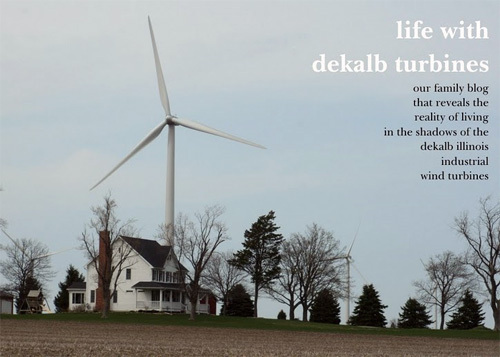 We have been bullied by a large industrial wind company (NextEra Energy, a subsidiary of Florida Power and Light [FPL]) and sold-out by the DeKalb County Board. FPL told residents that these wind turbines only “sound like a refrigerator.” Well, we have found that this is not the case. Oftentimes our yard sounds like an airport. We hear and feel the low frequency sound on our property as well as in our home. We are bothered by the noise, whistling, contant swirling movement, and shadow flicker. Complaining is not something that our family is known for doing and we teach our children to look for the positive aspects of life, but this has gone too far with the turbines. Someone needs to speak up. These industrial wind turbines should not be built close to homes. They should be at least a mile away to avoid these issues. We have 13 within a mile. The closest 2 are 1,400 feet away. I looked at several other videos/websites showing how people’s lives are being ruined, too. I showed these videos to my husband, and he too was shocked…..we have already told people the “truth” we’ve discovered. This is a glaring example of how big business has insidiously crept like a malignant monster into our lives, and there is no “chemo” to kill it. What can people do??? It’s getting worse and worse. We wish you the best…..